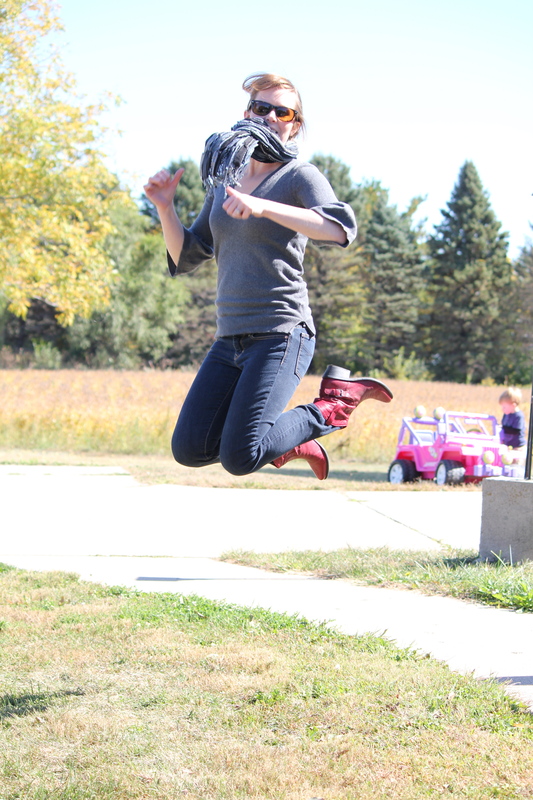 Ah…fall. I love ya! As soon as the calendar finds itself inching past Labor Day I put away the swimsuits and the flip flops and head straight to my fall decor stash where I spend an unnatural amount of time oohing and ahhing over dried wheat. It’s just not right. 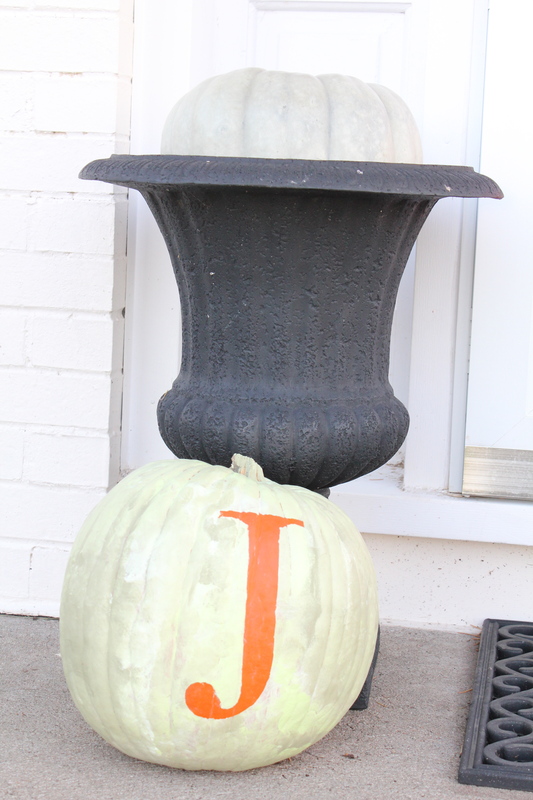 And while I obviously love fall decorating, the simple truth is that I am a thrifty seasonal decorator. 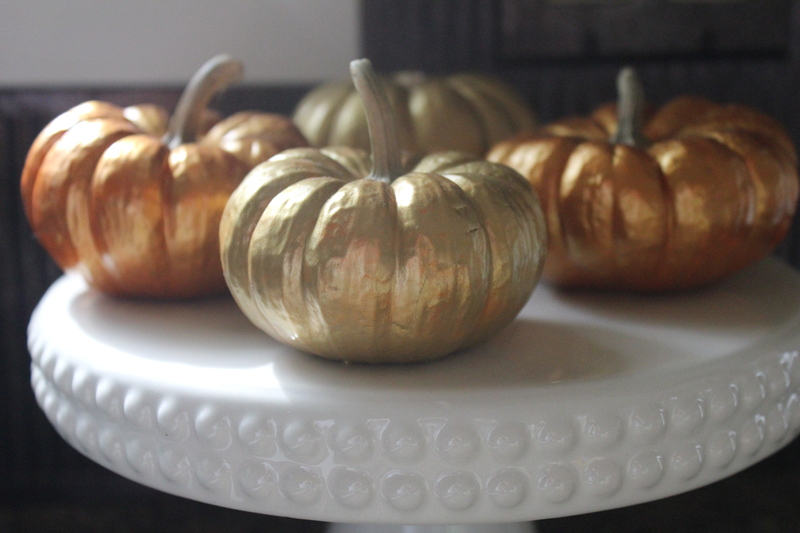 I spend a majority of my fall decorating dollars on items that can last from mid-September to Thanksgiving. I know it gives me more bang for my buck and has the additional benefit of tiding me over until the Christmas decor makes its grand appearance. Because of my extremely unscientific theory I go really light on the Halloween decor and really heavy on the harvest, autumn side of things. Exhibit A: Our front porch. 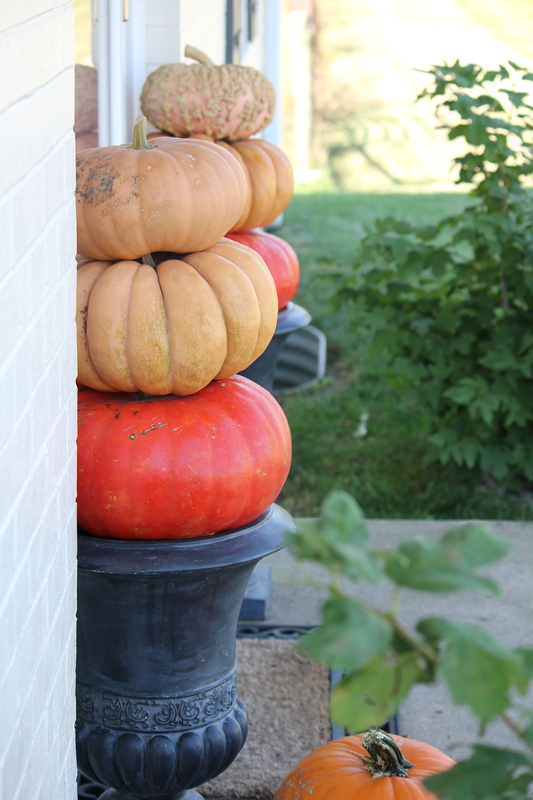 Last year I decorated ours with this collection of lovely pumpkins and gourds from a local pumpkin patch. I love a well-decorated front porch. Come to think of it, I love a well-decorated house. And a well-decorated table or party or backyard. Heck, I love a well-decorated pantry. Hold me. 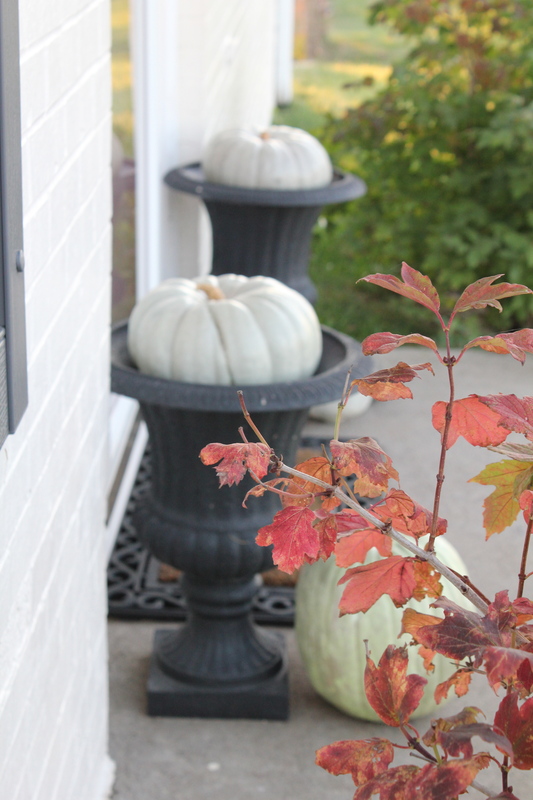 These orange beauties proudly flanked our front door until the end of November. 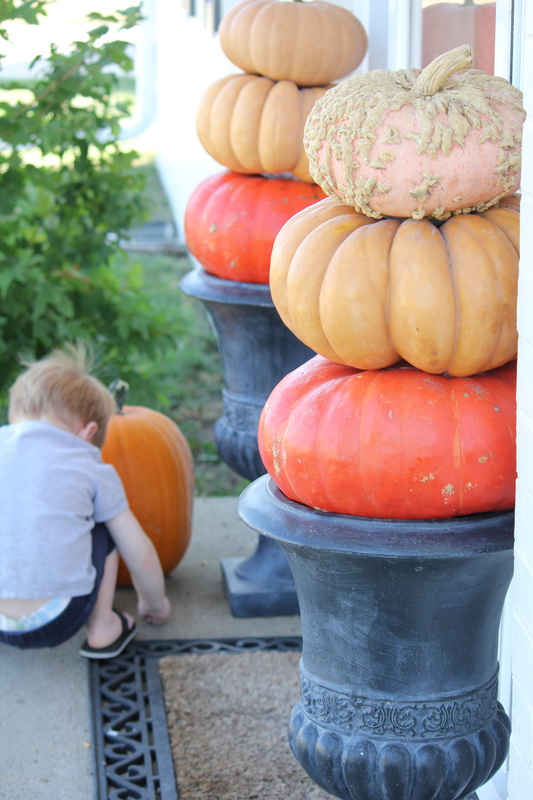 It was the first year I went the pumpkin/gourd route vs. the mum route and I don’t think I am ever going back. I think mums are beautiful and lovely and beautiful. Did I mention that mums are lovely and beautiful? But in years past I would either lose them in the first freeze or find myself having to remember to go outside and cover them up each cold and dark night. And then I’d have to remember to uncover them again in the cold, frozen morning. And they never made it to Thanksgiving. I’m forgetful and I’ll do anything to avoid being cold so the poor mums didn’t ever really have a fighting chance. And the best part? This freeze-proof loveliness is so simple to pull off! All you have to do is purchase pumpkins in three different circumferences and, if necessary, saw off the stems from the bottom two layers. 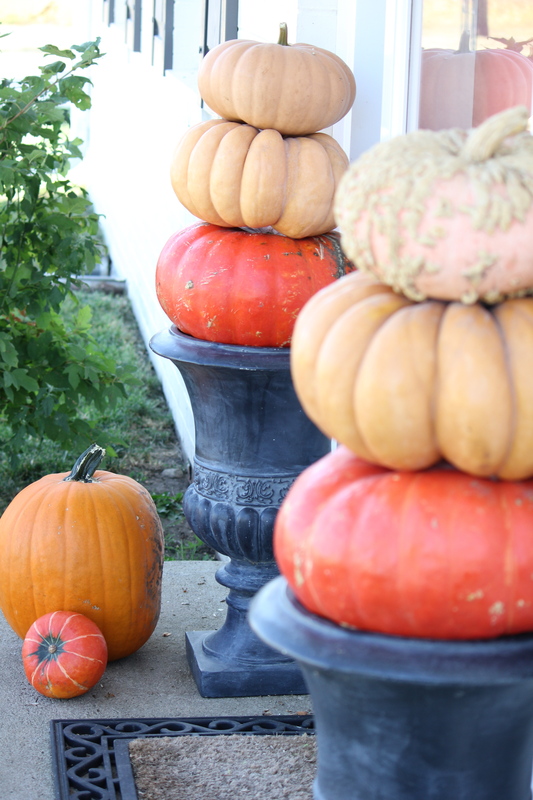 Then use your raw, brute strength to hoist the ‘kins on top of your pots or urns. Voila! Front porch gorgeousness. If available, you can also add your red-headed son to the display. 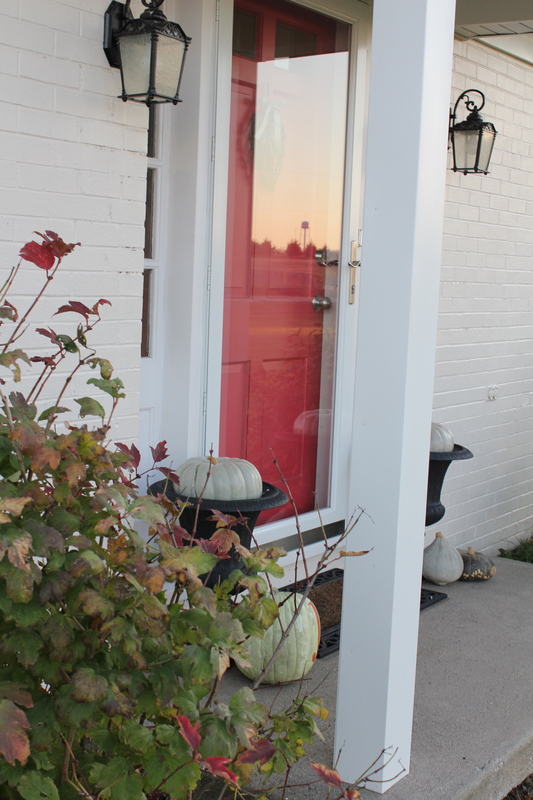 See I told you I get abnormally excited about a well-decorated front porch. Yessiree! Abnormal amounts of excitement happening here. Right here. 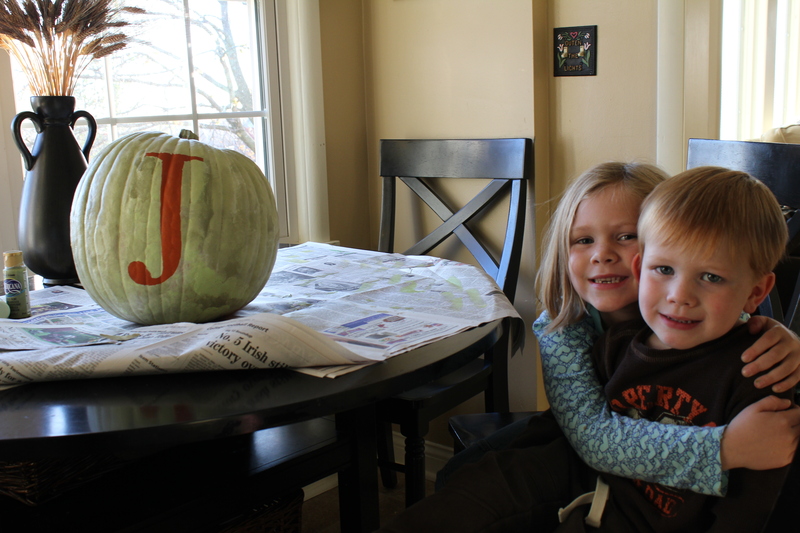 And now this year…our more subdued and budget-friendly version. Last year’s front porch beauty ran us about $60. This year? A little over $20! And I love it too. I love its simplicity and the non-traditional green colors. I feel calmer just looking at my front porch. Attention Visitors & Guests! Come! Breathe deeply, become calm and behold the beauty of the porch. Then come on in. For heaven’s sake, it’s cold out there! 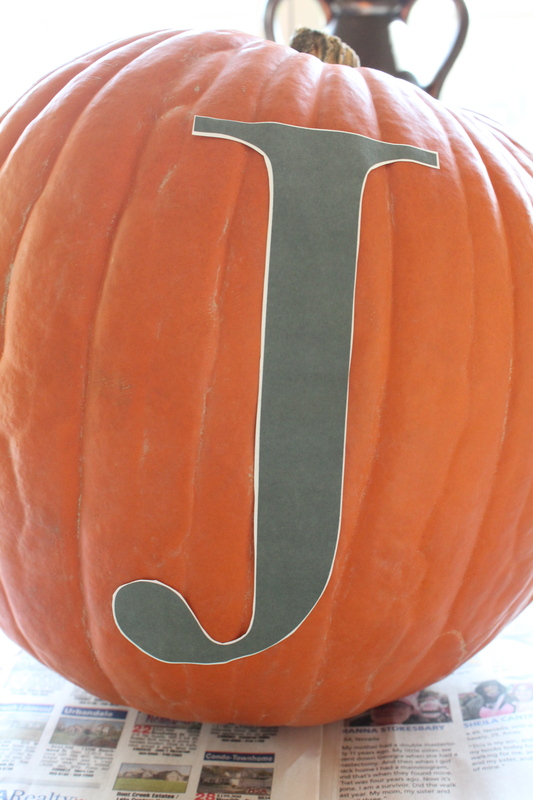 The monogrammed pumpkin was one of the cheapest craft projects we have ever completed. And the kids had a blast creating it! 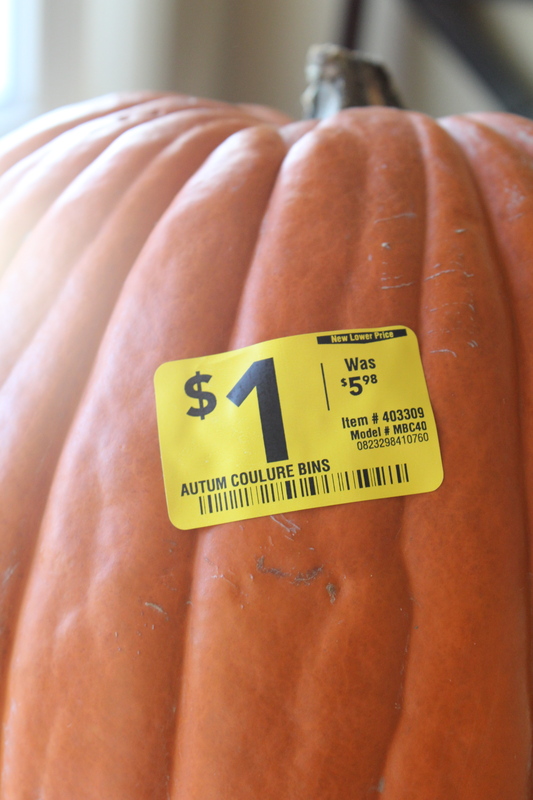 I scored this decent looking (beggars can’t be choosers) pumpkin a few short days before Halloween for $1.00. Yes! Then I sized and printed out our initial. I affixed it to the pumpkin with double-sided tape so it would stay in place while little fingers, hands and brushes went about the business of transforming this orange old boy into green gorgeousness. 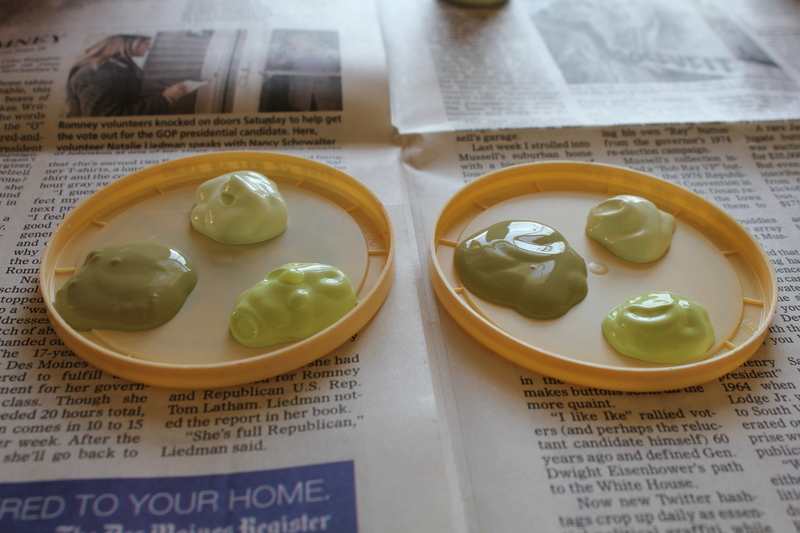 We used three different tones of green craft paint I had around from a previous project. Does anyone else use plastic yogurt lids for your craft paint? They are just the best. 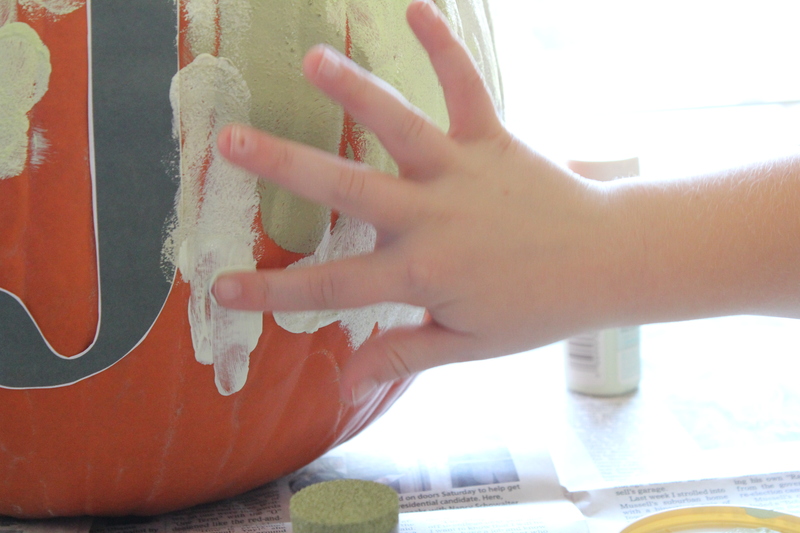 …and their fingers to paint the pumpkin. 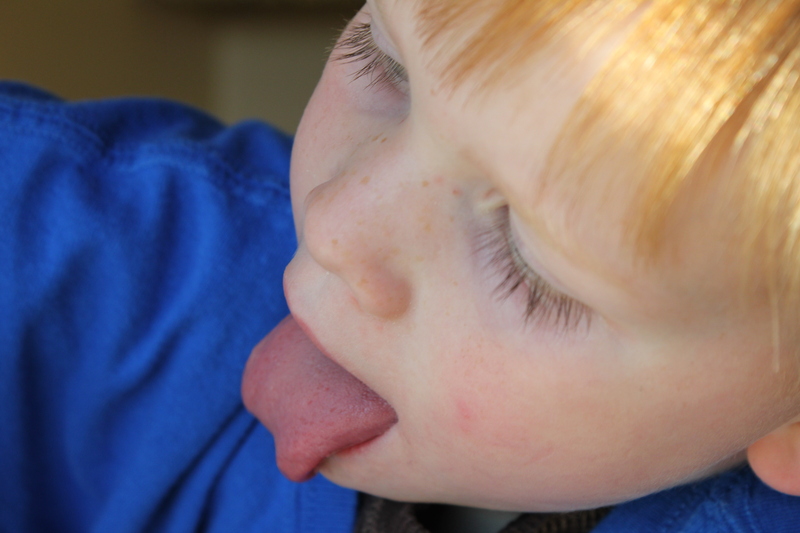 But no matter the method, ultimate concentration with tongue wagging is required. 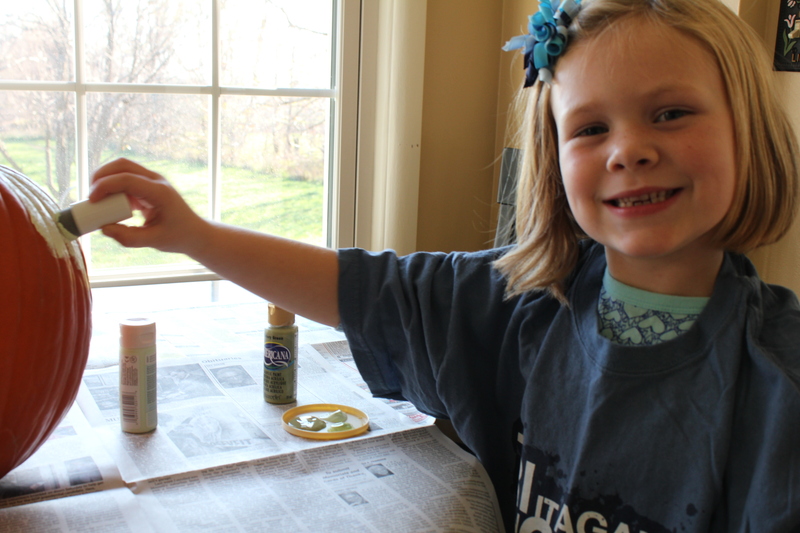 My son…the Michael Jordan of craft paint. In hindsight, I may have gone a wee bit nuts in the craft paint/pumpkin department this year. But I won’t apologize. I love these little metallic numbers. And my kitchen does too. And my kids can’t quit talking about them. O.K. That’s not at all true. But me and my kitchen are huge fans. HUGE! And one last idea. 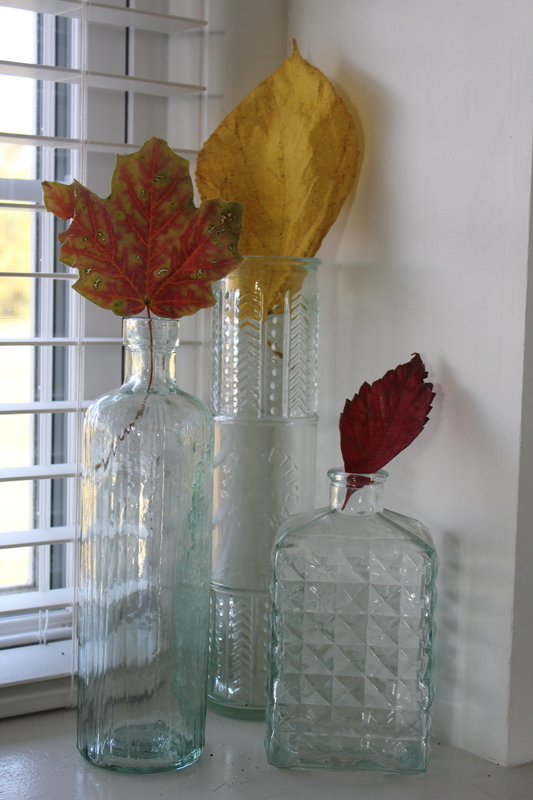 Simple leaves in simple jars decorate the built-ins in our dining room. The cost of this project? The time it took us to hike in the woods. Free and me are friends. Besties really. We go all the way back to my very first days of life when I didn’t pay for a single thing and screamed until someone fed me.